As one of Mexico’s top artisanal hubs, Guadalajara offers culture, cuisine and shopping. Travelers can find everything from expertly crafted pottery to luxe leather goods in markets throughout the city. For those who travel the world in search of the best locally produced, stylish souvenirs, Guadalajara provides a vibrant, festive atmosphere — after all, this is the birthplace of mariachi, tequila and charrería, the Mexican rodeo. Visitors to the historic center of Guadalajara will enjoy sightseeing with a backdrop of the architecture of the double-spired Guadalajara Cathedral. This area is home to Mercado Libertad, the largest indoor market in Latin America with three floors and nearly 3,000 stands featuring everything from apparel and handbags to fresh produce and local delicacies. Mexican cowboys, known locally as charros, frequent leather vendors in search of saddles, boots and belts. Across the street in the jewelry market, gold and silver pieces will add just the right Mexican accent to your wardrobe. Whether it is pumps or loafers, sandals or sneakers you seek, Guadalajara is the place to find the perfect pair of shoes. Make a beeline to Galería del Calzado, a shopping center focused exclusively on your feet. Choose from 64 stores offering everything from high-fashion designs to the hottest streetwear trends. In the colonial town of Tlaquepaque, local arts and crafts fill market showrooms and upscale stores where you will find carved wooden furniture, colorful blown glass ceramics and hand-stitched clothing. The downtown area retains the traditional structure of a small Mexican community with a parish street, central market, main square and many pedestrian-only streets, making this a good place to take a stroll. Catch the daily mariachi performances at the local restaurants and cantinas, some with outdoor seating perfect for people-watching. Some of the best bargains can be found among Tonalá’s narrow streets, where most of Guadalajara’s local goods can be purchased. In this neighborhood, you can find some of the best crafts in the country. This includes wide-mouth clay bowls designed to serve a cazuela cocktail, Guadalajara’s signature citrus punch. The area is particularly known for silver and gold crafts, hand-painted pottery, papier-mâché and clay figurines. On Thursdays and Sundays, bargain merchandise is sold at a vast street market where wholesalers arrive from all over the country to buy in bulk. In the district of Zapopan, the Andares Mall offers shoppers top-of-the-line luxury brands. After a day of shopping, join the locals as they enjoy a pedestrian corridor filled with high-end restaurants and bars near the basilica. Just outside of Guadalajara are sprawling agave fields, a UNESCO World Heritage Site, where tequila is produced. Drive past fields of the blue agave plant that stretch out over the rugged, hilly terrain, en route to the town of Tequila. 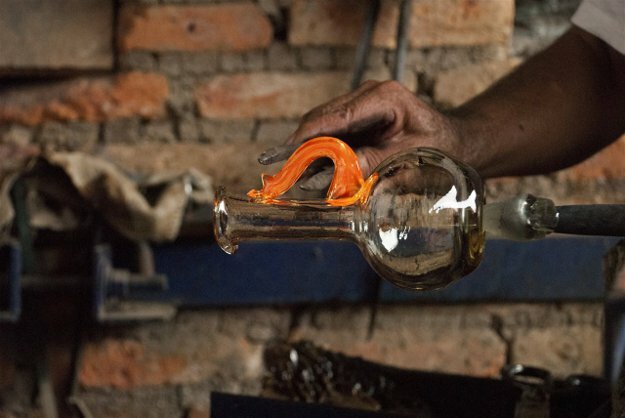 After visiting the distilleries and purchasing bottles to serve back home, peruse smaller shops and stalls for necklaces and earrings crafted using blue agave leaves, agave syrup and figurines made from the obsidian of the nearby volcano. For more information, visit www.visitguadalajara.com.